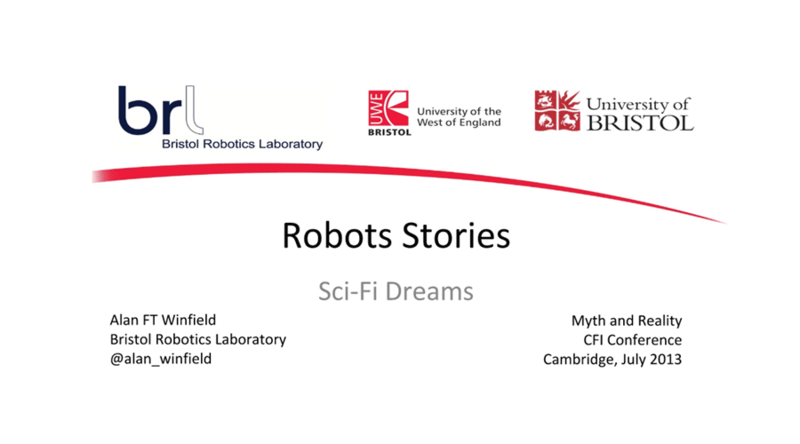 Here are the slides I gave recently as member of panel Sci-Fi Dreams: How visions of the future are shaping the development of intelligent technology, at the Centre for the Future of Intelligence 2017 conference. I presented three short stories about robot stories. The FP7 TRUCE Project invited a number of scientists – mostly within the field of Artificial Life – to suggest ideas for short stories. Those stories were then sent to a panel of writers, who chose one of the stories. I submitted an idea called The feeling of what it is like to be a robot and was delighted when Lucy Caldwell contacted me. Following a visit to the lab Lucy drafted a beautiful story called The Familiar which – following some iteration – appeared in the collected volume Beta Life. More recently the EU Human Brain Project Foresight Lab brought three Sci Fi writers – Allen Ashley, Jule Owen and Stephen Oram – to visit the lab. Inspired by what they saw they then wrote three wonderful short stories, which were read at the 2016 Bristol Literature Festival. The readings were followed by a panel discussion which included myself and BRL colleagues Antonia Tzemanaki and Marta Palau Franco. The three stories are published in the volume Versions of the Future. Stephen Oram went on to publish a collection called Eating Robots.